– Achievements – No notable awards but I have broken my thumbs three times on various dry slopes trying to get some notable ones. I have also worked at the British Ski Academy in Chamonix as ‘House mum’! – When did you first ski? 1990 at Reberty in the French Alps with my family. – On or Off Piste? Both, there is nothing quite like a nicely groomed piste to carve up but if there is powder off piste you will most probably find me there. – Snow dome or plastic? Plastic fantastic will always have a place in my heart. – One last run before you die? It would probably take a miracle but I would love to ski down Sheffield Ski Village again. – – Personal Statement. I was lucky enough to be taken on a ski holiday with my parents (thanks Mum and Dad) when I was nine years old and was bitten by the ski bug. A few years later I joined the snowsports club at the University of Manchester (SKUM) where I was introduced to the plastic slopes and got into racing. I became club chairperson and spent a lot of time taking student groups to Sheffield Ski Village, Rossendale and the perhaps less glamorous French Alps to either race or try out skiing for the first time. Shortly afterwards some guy called Frank introduced me to the best ski club in the world – Sharks!! 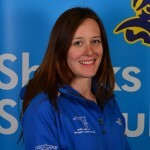 I feel very lucky to be a part of Sharks, it caters for everyone and provides excellent opportunities to progress. I have the privilege of instructing some fantastic skiers and love to see them grow in both confidence and ability.